We coach you to train! Do you love working with your dog? Do you want to know what makes him tick? If so, we can coach you through training your dog to better behavior. These sessions are tailored for clients who are invested in the private dog training process and love achieving the results themselves. Prefer we do the training for you? Click here! The Initial Behavior Consultation should be followed up with a minimum of 2 private dog training sessions to implement your customized training plan. Since every dog is different, we pride ourselves on assessing each unique situation, and creating customized, practical solutions for you and your family. Follow-up consultations typically last one-hour and will only be scheduled after an initial evaluation. Bundled Consultation Packages include the Initial Behavior Consultation and four Follow-Up Consultations, a $56 savings (or 10% off), plus 3 months of FREE e-mail or phone follow-up. Sixty minute ($100) private dog training lesson at your home. Perfect for learning simple skills fast, brushing up on obedience skills, or addressing nuisance issues like jumping and pulling on lead. Not appropriate for dogs with shy, fearful, aggressive behavior or for dogs with multiple issues. Our 30-minute phone consultation is super-convenient and ideal for single issues like potty-training, thunderstorm phobia and mild separation anxiety. 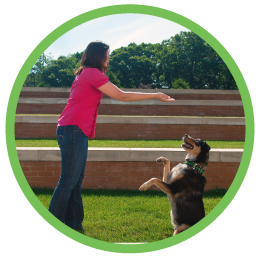 Schedule Dog Training!Schedule Private Dog Training!